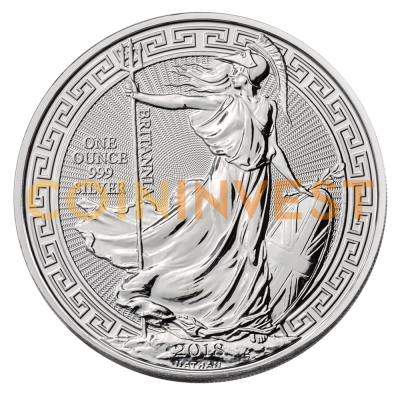 Order your 2018 1oz Silver Britannia Oriental Border now with coininvest.com to ensure that you don't miss out of one of the year's most anticipated releases. The world-famous Silver Britannia gets a makeover for 2018 with the addition of an elegant Oriental border. Certain to be the highlight of any collection, it's a must for serious coin fans and a clever choice for investors. The Silver Britannia is one of the Royal Mint's most successful coins and has been since it was first issued in 1997, 10 years after the Gold Britannia made its debut. To celebrate its expansion within Asia, the Royal Mint now adds this superb limited edition 1oz Silver Britannia to the series. The coin's exotic border design is a nod to the Chinese rooms at Buckingham Palace and Brighton Royal Pavilion. Only 100,000 of these elegant silver coins will be minted. Philip Nathan's world-famous reverse design of Britannia with shield, trident and olive branch is framed within an Oriental border. The coin's obverse features the definitive 'fifth-portrait' of Her Majesty Queen Elizabeth II by Jody Clark against a guilloche background. Why choose the Silver 2018 1oz Britannia with Oriental Border? Low mintages and unique design features make the 2018 1oz Silver Britannia Oriental Border an essential buy for imaginative investors. This special edition Oriental border silver coin is an excellent illustration of the premium quality and workmanship that the mint is known for. Plus, as legal UK currency, the coin is CGT exempt. Don't miss the chance to add the 2018 1oz Silver Britannia Oriental Border coin to your collection. Order now with coininvest.com for fast delivery. Add our 39mm coin capsules to your order to protect your valuable coins from wear and tear.